Another version of the Orion myth states that he had no mother but was a gift to a pious peasant from Jupiter, Neptune, and Mercury. "Orion supposedly was able to walk on water and had greater strength and stature than any other mortal. A skilled blacksmith, he fabricated a subterranean palace for Vulcan. He also walled in the coasts of Sicily against the encroaching sea and built a temple to the gods there" (Magee, 48). Orion fell in love with Merope, daughter of Oenopion and princess of Chios. Her father the king, however, would not consent to give Orion his daughter's hand in marriage--even after the hunter rid their island of wild beasts. In anger, Orion attempted to gain possession of the maiden by violence. Her father, incensed at this conduct, having made Orion drunk, deprived him of his sight and cast him out on the seashore. The blinded hero followed the sound of a Cyclops' hammer till he reached Lemnos, and came to the forge of Vulcan, who, taking pity on him, gave him Kedalion, one of his men, to be his guide to the abode of the sun. Placing Kedalion on his shoulders, Orion proceeded to the east, and there meeting the sungod, was restored to sight by his beam. After this he dwelt as a hunter with Diana, with whom he was a favourite, and it is even said she was about to marry him. Her brother [Apollo] was highly displeased and chid her [she was, after all, a virgin huntress], but to no purpose. One day, observing Orion wading through the ocean with his head just above the water, Apollo pointed it out to his sister and maintained that she could not hit that black thing on the sea. The archer-goddess discharged a shaft with fatal aim. The waves rolled the body of Orion to the land, and bewailing her fatal error with many tears, Diana placed him among the stars (Bulfinch's Mythology, 191-192). Zeus, king of the gods on Mount Olympus, sent a giant scorpion to kill the mighty hunter Orion to end a torrid love affair between Orion and Diana, daughter of Zeus and goddess of the moon. Orion hunted by night and slept by day, and while he was on his nocturnal hunting adventures, he was noticed and admired by Diana. As the affair continued, Diana would join Orion on his hunting jaunts, ignoring her lunar duties. 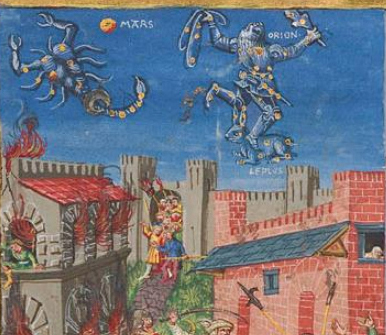 When Zeus learned of his daughter’s negligence, he sent a giant scorpion to sting and kill Orion during his daytime slumber. When the fateful clay arrived and the giant scorpion approached Orion, the hunter awoke before the beast could strike. Orion put up a good fight, but the scorpion still stung him, and the hunter died instantly. That night, Diana discovered Orion’s body and was filled with tremendous grief. She lifted her lover’s body to the sky and transformed it into the constellation we see during the winter evening. As she looked back to Earth, she saw the giant scorpion not far from where she found Orion. She dived at the scorpion, grabbed it and flung it in the opposite direction from where she had placed Orion. That’s why Orion and Scorpius are never seen in the sky at the same time. I read a different bit of prose on the subject, where Apollo's jealousy brought him to summon the scorpion whilst Orion fled to the sea, eventually being killed. Interesting note: The scorpion king glyphs from Egypt depict a scorpion in the sun (Apollo). I believe this story is one of the ancient methods of preserving the recipe for the stone.